Cana Island Light with its low dwelling and tall white tower surmounted by two story black lantern is perhaps Door County’s most photographed, painted, and videotaped lighthouse. Perhaps this is because it looks most like what people think a lighthouse should look like. 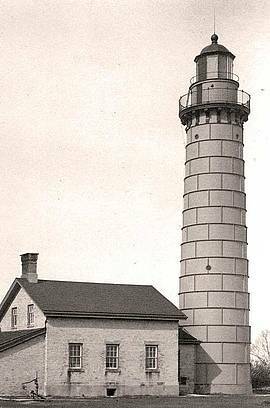 When the Lighthouse Board decided to replace rather than repair the Baileys Harbor Lighthouse, they chose to build the new lighthouse on 8.7 acre Cana Island between Moonlight Bay and North Bay. Congress appropriated funds in the spring of 1869. Once funds were appropriated, a Lighthouse Board crew began clearing about three acres at the eastern end of the low island. The crew built, on a rock foundation, a 42 ‘ x 20 ‘ story and one-half keeper’s dwelling, and an 8’ x 10 ‘ covered walkway connecting the dwelling to the light tower. The crew next erected an 18′ diameter tower that tapers to 16′ in diameter at the base of the watch room and rises 65’ above the foundation. The entire complex was built of cream-colored Milwaukee brick. In 1869, the tower was the tallest brick structure in Door County. Whether Cana Island is really an island or just the end of the peninsula depends on the level of Lake Michigan. The causeway leading to Cana Island is a natural feature, although at times foot bridges have connected the island to the mainland. Because it sticks out into the Lake, Cana Island is terribly exposed to both wind and wave. The shallowness of the waters around the island cause storm waves to break offshore, but this only partially lessens their effect. In the late 1870s and early 1880s, Keeper Warren Sanderson and his family experienced several very dramatic times when storms flooded the area around the lighthouse with water several feet deep. At other times, waters flooded the cellar and ran through the kitchen. During the famous Alpena Gale in October 1880, storm waves actually swept through the house. To help halt the flooding, in 1890 the Lighthouse Board ordered the filling in of nearly one-half acre of low swampy land surrounding the lighthouse. Cana Island’s cast iron lantern atop the tower has two levels, the watch room at the top of the tower surmounted by the lantern room containing the lighthouse’s lens, which is a third order Fresnel lens built in Paris, France. The focal plane of the lens is 75′ above the base of the tower and approximately 82 ‘ above lake level. William Jackson, the first keeper, officially lit the light on January 24, 1870. Keeper Oscar H. Knudson built the stone wall at the edge of the lawn around the lighthouse. Keeper Clifford Sanderson lived on Cana Island as a child and returned as a keeper. Keeper Ross Wright was one of the last civilian keepers of the light. When World War II broke out, the Coast Guard took over Cana Island Station and has maintained the light ever since. In the 1970s, the Door County Maritime Museum, desirous of preserving a part of Door County’s maritime heritage, leased Cana Island from the Federal Government and opened the Island to visitors. The dwelling and tower, however, were not opened to visitors. Few of the many visitors to Cana Island today realize that the tower and dwelling were originally constructed of the same cream colored brick. Today, from the outside, no evidence remains of the tower’s brick construction. In 1902, the deteriorating condition of the brickwork prompted the Lighthouse Board to encase the tower in steel plates. The tower was then painted white. The light, now powered by electricity, is turned on automatically at dusk and off at dawn, and still shines out across the water to guide sailors as it has done since Keeper Jackson first lit the light in 1870. Be a modern-day lighthouse keeper, support the preservation efforts at Cana Island Lighthouse.